Cook fresh corn on the cob in the microwave with husks and silks intact! Since the corn cooks in its own natural moisture, it couldn't be easier! Microwave corn on HIGH 16 min., turning after 8 min. Meanwhile, mix remaining ingredients until blended. 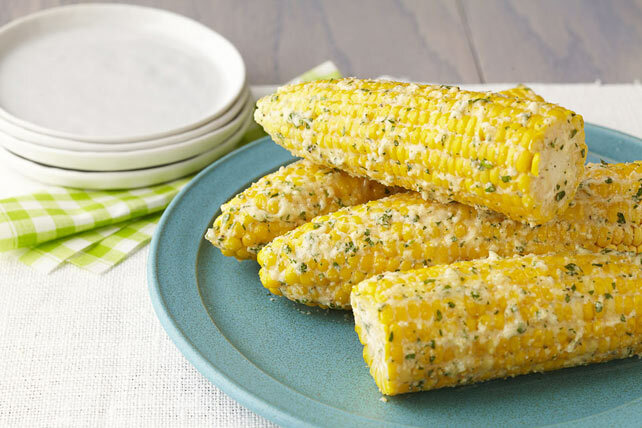 Spread corn with dressing mixture. After cutting the bottom end off each corn cob, grab the corn by the silk end and shake the ear several times to remove the corn from the husks. The cleaned ear should easily fall from the husks through the cut end. Cooked corn will be hot! Be sure to use oven mitts when removing the cooked corn from the microwave. Prepare using Pure Kraft Calorie-Wise Refrigerated Asiago Caesar Dressing. Here's a tasty way to eat corn that can be part of a healthy eating plan.